Today, Edaran Tan Chong Motor (ETCM) gives away a brand new Nissan Sylphy during the ‘Test Drive & Win’ Round-2 prize presentation ceremony at ETCM Jalan Raja Laut Showroom. I was there to witness it personally. The ‘Test Drive & Win’ Round-2 campaign was run from 1st August 2011 to 30th November 2011. 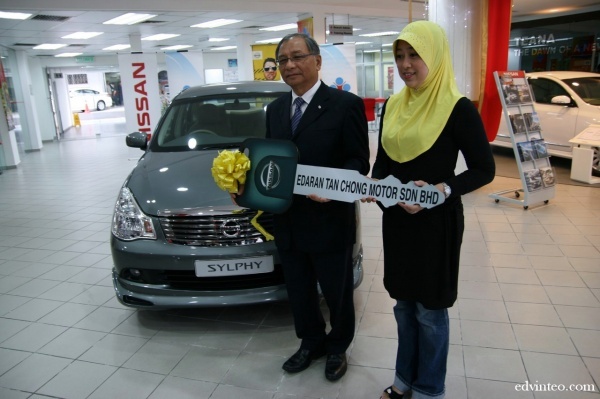 The lucky winner, Tengku Norul Karlina Binti Tengku Yunus from Kuala Lumpur drive away a new Nissan Sylphy with Impul aerokit with her family members. For now to stand a chance for you to win a brand new Nissan Teana or 370Z in Round-3, you can participate the contest by test driving any Nissan vehicles at any ETCM showrooms between 1st December 2011 to 31st March 2012. Good luck to all of us!